The Corning Preserve in downtown Albany pays respect to Yankees legend, Derek Jeter, as he takes the field at Yankee Stadium one last time Thursday night. Not only will you see Jeter’s famed number 2, shining brightly as the tower lights up with the captain’s digit, but you can also witness history and watch his final game in Yankee pinstripes at the Egg, on the big screen! Derek Jeter, the face of baseball for the last decade, and consummate Yankee, is winding down an illustrious twenty-year career. 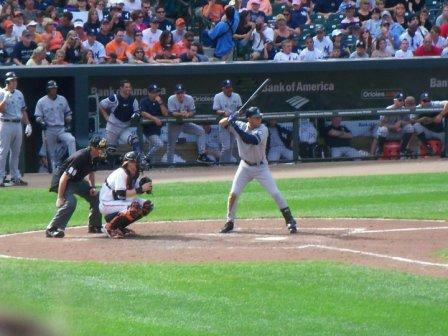 Captain of the team for 11 seasons, Jeter helped deliver five World Series titles to New York, appear in 14 All-Star games and sits sixth on the all-time hit list. On the field, his leadership and accomplishments are second to none and off the field, he’s a role model for millions. Thursday night, when the Yankees take the field against the Baltimore Orioles, Jeter will suit up in the Yankee pinstripes and take the field at Yankee Stadium one last time before he hangs up the cleats. Here in Albany, you can watch the historic moment downtown! The Corning Tower and Egg have gotten together to do something special, tipping their cap to the Captain. Thursday night, September 25th, the Tower will light up with Jeter’s number, 2. At 7:05 PM, the Egg will then broadcast the Yankees game as they play the Baltimore Orioles live on the big screen! According to the Times Union, there will be vendors on hand, selling food. Jeter has roots here in Albany, NY. In 1994, Derek played 34 games with the now defunct Albany-Colonie Yankees. Over at Heritage Field, by the airport, Jeter rose through the Yankees’ minor league system. If you can’t afford to attend the game (last row in the bleachers is $230 on the secondary market), you can always go down for free and watch history here in town, where history grew up. Kudos, Corning! Posted on September 24, 2014, in Local Stuff, Sports and tagged albany, Corning Tower, Derek Jeter, Derek Jeter's Last Game, The Egg, Yankee Stadium, Yankees. Bookmark the permalink. 1 Comment.